When ordering a medical alarm device, you will also receive a special set of alert necklaces and bracelets to use with your medical alert system. Medical Alert Necklaces are the most commonly used form of alert buttons, and can be unisex and worn for both men and women. Nowadays, alert necklaces and very sleep and stylish and you can contact emergency EMT or medic with the simple push of the button. If you're a senior and have experienced a fall, then wearing a simple alert pendant around your neck or a wrist watch and bracelet on your arm is a simple solution to protecting yourself in case a fall happens again. 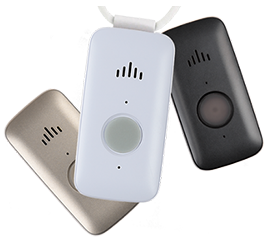 Falling is not something to take lightly as 1 in 3 seniors will encounter a fall this year, and the scariest thing about a fall is that sometimes it's hard to get up and to have the security of a medical alarm pendant will ensure your safety and protection. Most alert bracelets can be worn as a jewelry for women or a like a watch for men. These bracelets work and coordinate with local emergency and 911 dispatch centers. The alert system in the bracelets trigger an alert to call local 911 so the location of a senior can be displayed to the dispatcher and update consumers to immediately respond to the exact location of the person pressing the emergency alert button. If you're concerned about the look and feel of these alert necklaces, you really have nothing to worry about. Many of the alert necklaces are very natural looking and people couldn't even tell that the pendant had an alert button on it. It's easy to tuck the pendant or button into your shirt and hide it so no one even knows it's there.